Nicholas is 10 years old and goes to my sister’s church. He made this brilliant stop animation video telling the Easter story. It will cheer your Easter Sunday evening. Guaranteed. One of the speakers on the Walk of Witness in the tow-un yesterday reminded us of how we are all part of that crowd that called for Christ to be crucified. This clip from Igniter Media highlights how the cross redeems us – how we can be forgiven for our part in the crowd. I shall be fetching our Resurrection Eggs from their storage cubby hole in the cellar. I *think* they are buried with the Christmas decorations. You could also do something similar with a toddler group or even a holiday club. There’s still time to sort yourself a set out and get in a dozen or so readings. We’re still listening to the NIV Audio Bible at teatime – heading for Jerusalem in John’s gospel. Lazurus was raised this evening and the Queen remarked ‘Every chapter it talks about people who believe‘. I think our time listening to the bible being read has been worth it just for this. I am in charge of the catering for our first ever Passover Supper at church on Maundy Thursday. I have a great recipe for slow cooked shoulder of lamb but will also have to source matzos and parsley in appropriate quantities. I anticipate long lists and negotiations with our high street butcher. 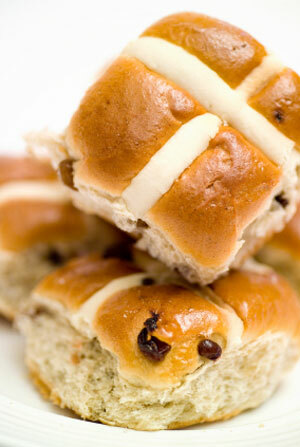 I have booked the lovely Bee to help out with an Easter Cake and Chat in the morning of Maundy Thursday. A sort of DIY Easter Holiday Club – she has lots of lovely Easter crafts up her sleeve. How are you preparing to celebrate the death and resurrection of the Lord? I’m sure a bunch of you have already seen this around the blogosphere, but I only spotted it yesterday. It’s a really cool picture of where everyone was in Holy Week – Jesus, the disciples, the Jewish leaders, the crowds, the guards etc. Am wondering how to get this printed out much bigger – A0 would be cool. BibleGateway, who published it, have more details, as do openbible, who designed it. Our Parent & Toddler group is a thriving ministry and the leaders are great at taking opportunities each week to share the gospel. Two notable opportunities that are taken are at Christmas and Easter. A short ‘Toddler Praise’ service takes place as part of the normal session in the church. This year I was asked to do the short talk. My natural comfort-zone is Pathfinders (11-14 year olds), but I agreed nonetheless! 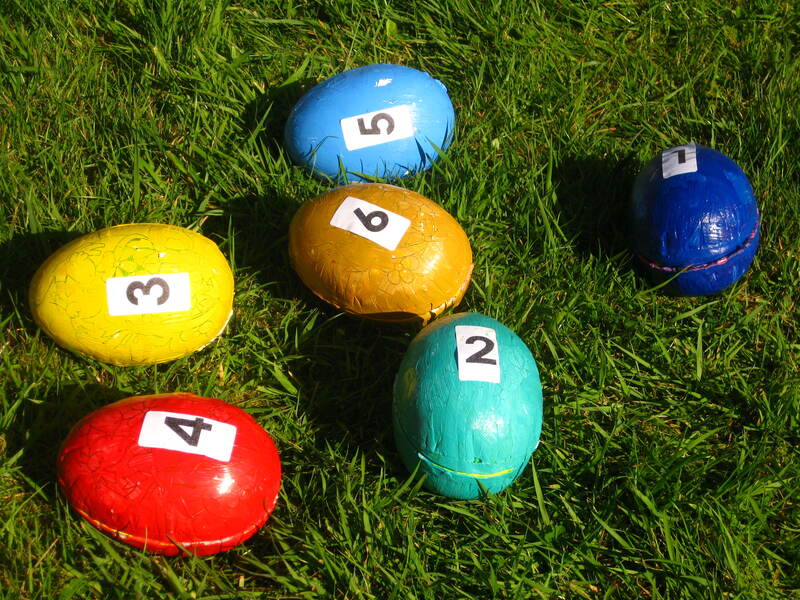 I remembered reading about Resurrection Eggs last year, and so took the idea and adapted it for pre-schoolers. I reduced the number of eggs involved down to 6. I also used much larger eggs. My local Hobbycraft had some ‘paint your own’ cardboard eggs, about the size of an average chocolate Easter egg. I painted them in bright colours and numbered them 1-6. The numbering was crucial, if only so that I opened them in the right order! The colours were just for the children. I scattered the eggs about for the children to find at the appropriate time(which they were very eager to do). Although the way I told the story was aimed at getting and keeping the children’s attention, I was aware that parents would be listening, so some of the language is maybe a bit adult for the younger toddlers. I explained to the children that I was to tell them a true story; that it was all about the first ever Easter and was all about Jesus. I said there were some sad parts, but there were also happy parts. I explained that to help us learn this true story, there are some eggs hidden around the place that have bits of the story inside. At this point some children ran to get the eggs, whilst others sat still pointing to where they were…! Donkey – Jesus was going to a town called Jerusalem with his friends. He rode into Jerusalem on a donkey. Some people were very happy to see him, and they welcomed him, shouting ‘Hosanna’ and ‘Jesus is King’. But some of the leaders weren’t very happy to see Jesus. They didn’t like that the people liked Jesus. Praying hands (just a picture found via google) – Later that week, Jesus went with his friends to pray in a garden. Jesus prayed to his Father God that he was doing the right thing. But while he prayed, soldiers, sent by the leaders came and arrested Jesus. Cross – The soldiers took Jesus away and made fun of him, and put a heavy wooden cross on his back. He was made to carry it up to a nearby hill. Some people cheered, but some people knew this was very sad, and cried. Nails – On the top of the hill, Jesus was nailed to the cross. It hurt him a lot. Jesus had never done anything wrong, like we have, but he was treated like he was a criminal by the soldiers. Even though this was the middle of the day, on a Friday, it became really, really dark. In the dark and with the sadness of his friends and family, Jesus died. Empty! – Jesus had risen from the dead. It was such happy news. Our true story has a happy ending. I went on to explain how it can be a happy ending for us today, because Jesus died and rose from the dead so we could be saved. I also said: “When we say or do things that are wrong, we must say sorry, don’t we?, to our parents or friends or brothers or sisters. We need to say sorry to God too. We ignore him, we say wrong things, we do naughty things. The Bible calls this sin. Because of Jesus, who has never done anything wrong, or said anything naughty, and has never ignored God, we can be friends with God. We can be saved. Jesus’ death and rising again means we won’t be enemies with God, if we trust in Jesus and ask God for his forgiveness. We will be safe and we will be forgiven. >- Make sure an adult is nearby to give the nails to when that egg is opened! With the other items, the Toddlers often picked them up to wander off to show their parent or grandparent. – This could be adapted and expanded for an all-age service with Bible readings included in the contents of the eggs to make it helpful to a wider age-range, along with other parts to the service as well of course! Tyndale House, the biblical research centre in Cambridge, have produced three short video clips for Easter, with biblical scholars talking about evidence for Jesus’ trial, death and resurrection. One of the clips, where David Instone-Brewer and Peter Williams are looking at the Munich Talmud, was something I’d never heard about before – a very early Jewish manuscript tradition which speaks of the charges that were brought against Jesus. Fascinating.